I don't expect Apple to deliver on rumors. 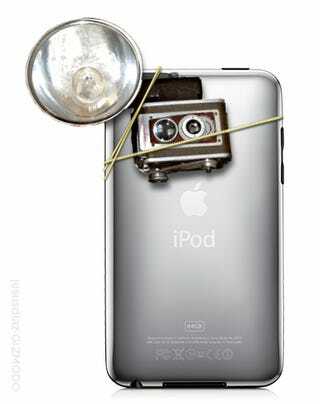 After all, most rumors are crap, even John Gruber's iPod touch camera prediction. But that doesn't stop me from asking questions: Why the hell there is no camera on the iPod touch? • No Space: The iPod touch is much thinner than the iPhone. There is not a lot of empty space in there, so maybe this is a technical decision. Perhaps Apple couldn't find a part that could fit in the current case, and they didn't want to alter the touch's physical dimensions. But then again, if the minuscule iPod nano can get a camera, why not the touch? Perhaps it's because the nano got a pretty weak camera. • Features Mix: Apple could possibly have fit the iPod nano camera in the iPod touch, and kept the price. After all, it's a super-tiny, ultra-cheap VGA camera. But maybe that acronym the key: It's VGA. Low resolution. The nano doesn't even do still photography because it will look like crap—video is more forgiving. People buying the iPod touch would be expecting a lot more. I know I would. So while there's the possibility of a camera in the iPod touch, perhaps is not the camera Apple thinks would be right for it—namely, the iPhone's camera. • Technical Difficulties: This was one of the late-minute rumors: Apple had technical difficulties during manufacturing, so the rumor said the iPod touch—with camera—was going to be delayed. If that was the case, Apple would have just announced the iPod touch with camera, and get it to the stores later. However, the iPod touch without camera is here, available immediately, which means that they have been churning them out the factory for a long long time. It doesn't seem like a last minute change of plans to me. Technical Troubles with New iPods to Delay Release? • Pricing Issues: Apple wanted to have a $199 iPod touch, and keep the prices of the bigger units while increasing capacity. This sounds more reasonable than the technical excuses. The 8GB version, however, is just the old one, which is being manufactured like always to get that "low" price. No camera could be added to it, unless Apple wanted to sacrifice on the price front. Only the 32 and 64GB versions have internal hardware modifications. But would Apple have an iPod touch with camera and one without? Seems unlikely for a company obsessed with uniformity and streamlining. • Market Segmentation: Here things get more interesting. Apple said they wanted to compete with the Flip, which is a sub-$150 device. It's almost impossible to get the iPod touch to that price level while keeping the large touchscreen, the wireless capabilities, and the strong processing guts that the iPhone OS needs. Not right at these prices—at least, not without affecting their profit margins negatively. The iPod nano, however, can fit the Flip competition role nicely. This is a probable explanation. • iPhone Cannibalization: The other explanation is cannibalization. This is a good one too. Add a camera to the iPod touch and, boom, the iPhone loses yet another advantage over its lesser brother. So maybe putting the iPhone's camera into the iPod touch is feasible. Apple may just be protecting the market for the iPhone. • Feature Evolution: This, to me, is the most reasonable explanation. Apple is getting oh-so-lazy. Or, better said, greedy. They are the number one player in every single category. They own the market. And they know the competition is just catching on. So instead of releasing an iPhone that is way better than the previous model, they release the modest upgrade of the iPhone 3GS. And instead of releasing an iPod touch with a nice camera, they just slap some new software, slightly updated guts and more memory. That's what you get when a company owns an empire, and the other tiny people are trying to catch up with an already phenomenal device. The company gets slow and complacent, and does the minimum to keep its products ahead. So no, I don't expect Apple to deliver on rumors. But it pisses me off that they don't do their best every single time. That they get boring and lazy. And yes, perhaps it's not in their best economic interest to release insanely great products in every single update, but the lack of camera on the iPod touch is sure going to be a letdown for a huge number of people. Some other people won't agree. Some cheerleaders would even go onto their soap boxes, saying that "Apple is firing on all cylinders." Maybe they are. It's just that they left the Porsche GT2 at home, and they are now driving an old Mini. Update: The JesusSteve is back not only for the show-n-tell. He also gave his own reasons in a quick New York Times Q&A.